As if the numerous orchards with the dangling semi ripe mangoes weren’t sufficient enough to entice me, Ratnagiri opened its arms and welcomed with breathtaking vistas of its magnificent beaches. As I rode down along the coast from Harnai Murud past Ganapatipule, vantage points with spectacular views unfurled giving a glimpse of what lay ahead. Gliding down the hills and meandering along the road parallel to the sea was as much an adrenaline rush as it was to see the delightful landscapes. This stretch is probably the most scenic one along the coastline of Maharashtra and ideal for a road trip. Apart from the mango orchards along the road, there were numerous road side vendors selling the king of fruits as I entered Ratnagiri. Though this town along the Konkan coast comes alive during the summers when alphonso mangoes can be seen all over, the languorous beaches are what beckon and get you back here. Sprawling over the hills just outside the city centre, Ratnadurg fort stands tall facing the blue sea. The fort which was captured by Chatrapati Shivaji Maharaj was built during the times of Bahmani empire. 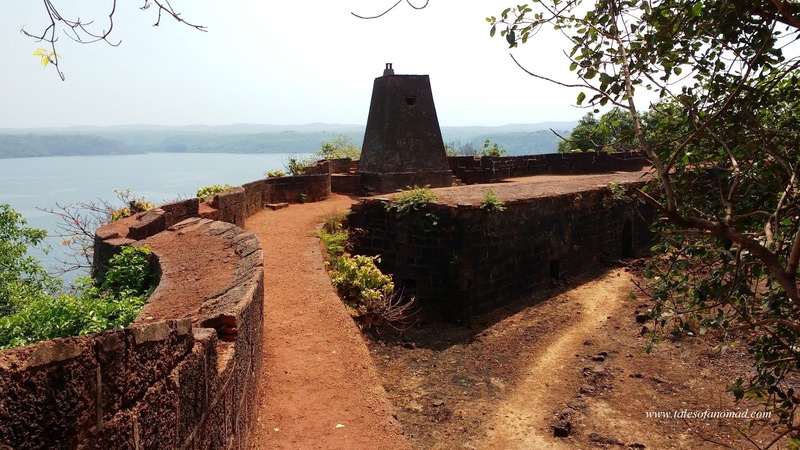 Though it is only the outer walls and bastions that remain intact, a stroll along its periphery offered majestic views of the sea, beaches in the distance, numerous bobbing boats and the fishing dock of Ratnagiri. The fort also houses Bhagwati temple which also gives the fort another name- Bhagwati Qila. Just outside the fort walls, the adjoining mount too has remains of a few tombs and walls. Atop that hill is Kaledot point, a vantage point that offers lovely views. After strolling inside the fort I walked out and sat at the view point to enjoy a serene sunset. Though it is a short ride away from Ratnagiri town, it was a nice morning ride to Purnagad fort. A detour off the highway, the isolated fort located atop a small hill looked totally deserted when I walked in. Except for a Hanuman temple near the entrance and the fort walls with clambering creepers all over, the fort has nothing else to offer. Located next to a creek, the views from the fort walls looked beautiful. On my way back from Purnagad to Ratnagiri, took a detour to the secluded Ganeshgule beach. The serene beach with white sands and casuarinas in the backdrop was totally devoid of people despite the presence of a couple of resorts in the vicinity. Kurli beach, another detour from the highway was another pit stop on the way back. Ratnagiri has an interesting Burmese connection as Thibaw, the dethroned Burmese king was sent to exile in Ratnagiri in early 20th century. Thibaw palace, built in Burmese architecture was home to the king who was forcefully sent here by the British. Presently the brightly painted structure is a museum that has galleries which display various items used by the king and royal collections. Near the palace, the Thibaw point is a watch tower that offers panoramic vistas of Kajali river meandering through the greenery and disgorging itself into the Arabian sea. Apart from that, it also offers an aerial view of Ratnagiri along with numerous fishing boats moored at the dockyard. Later in the evening I headed out to the inviting beaches of Ratnagiri, starting with Mirya beach. The cove shaped beach is more of a fishing hamlet with many fishing boats lined up. Further ahead the Pandre Samudra beach is known for its white sandy stretch with swaying palms in the background. Batye beach, the prominent seaside of Ratnagiri is just outside the town and is its most popular beach. With camel rides, horse carts and ATVs, Batye beach is a crowd favourite, which also means that the commercialization has its marks all over. However, what I loved is the beautiful sunset that was on offer as I languidly walked around. The last day of my sojourn in Ratnagiri began with an early morning ride on the magical road to Ganapatipule. 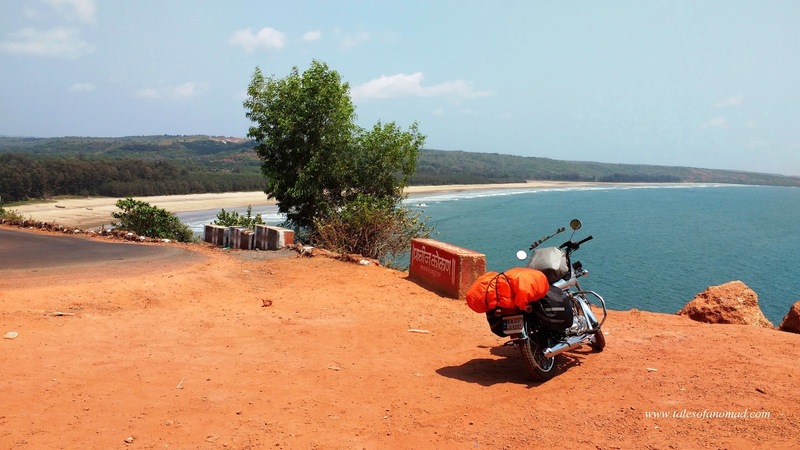 As you ride on this stretch between Ratnagiri and Ganapatipule, the stunning canvases of blue sea and white golden sands rush past your visor. As much as you want to ride, the numerous vantage points make you stop and gaze at the vistas. A long line of Alphonso mango vendors invited me at Ganapatipule. Even at 8 in the morning Ganapatipule beach was fairly crowded with people strolling around, camels waiting for the rides and boats all set to rush into the waters. Despite the commercial aspects, the long beach looked clean, gorgeous and is ideal for some beach cricket. 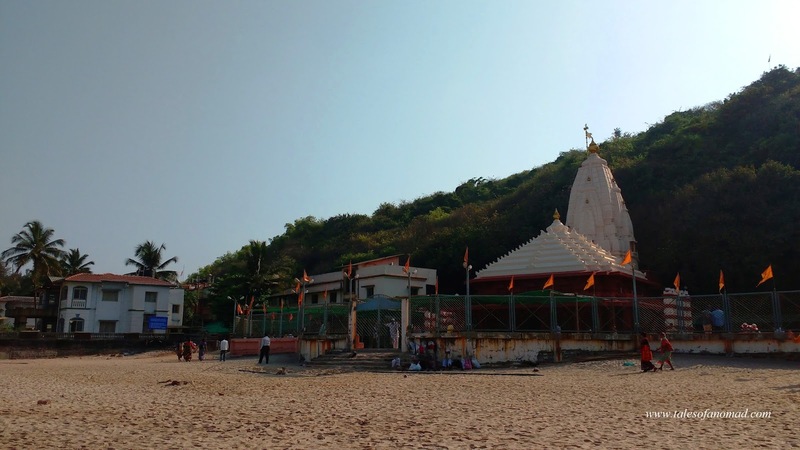 The popular Ganapati temple on the beach gives the place its name (Ganapatipule means sands blessed by Ganapati) and is located at the base of a small hill. Though there are numerous shops and stalls selling mangoes, mango pulp and kokum syrup, Govind Kelkar supermarket is the best place to buy them. A short distance away and located by the road is Malgund beach, another absolutely serene and pristine beach that remains devoid of commercialization. Prachin Konkan is an open museum that displays the regions traditional lifestyle. It also has an array of handicrafts on sale. After a delicious Konkan fish thali at Ganapatipule, I headed further north to Jaigarh fort. The 17th century fort has numerous bastions and a climb up them offers nice views of the sea and the numerous boats passing by. On the way back to Ratnagiri I dropped by the beautiful beaches of Bandarpule, Kajir Bhati and Aare Ware. While Bandarpule is a nice cove shaped beach, Kajir Bhati is a long one with a thick vegetation of casuarinas in its background. The spectacular aerial view of the white sands of Kajir Bhati beach just before reaching it is probably its highlight. As I strolled around the beautiful beach, more people walked in and I headed to the popular Aare Ware beach. 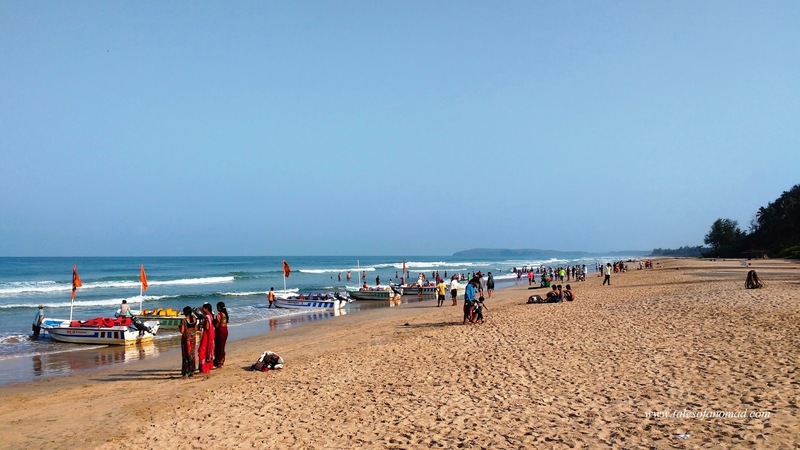 The endless sandy twin beaches of Aare Ware are undoubtedly the favourite and arguably the best beaches in Ganapatipule. Aerial view of the swaying coconut trees and the white sands formed a beautiful frame against the setting sun as I stopped by the road over the cliff. Though it has nice vistas from here, I equally loved a stroll on Aare Ware beach as it offered clear views of the endless shoreline. Ratnagiri is an ideal stretch along the coast of Maharashtra to stroll on long sandy beaches and enjoy the sunsets while delving into some delicious Alphonso mangoes in the Indian summer. Ratnagiri is 346 Kms from Mumbai and 233 Kms from Panjim. The closest airport is at Dabolim, 255 Kms away. Ratnagiri is well connected to most cities in Maharashtra by rail and road. Ganapatipule is 26 Kms from Ratnagiri. 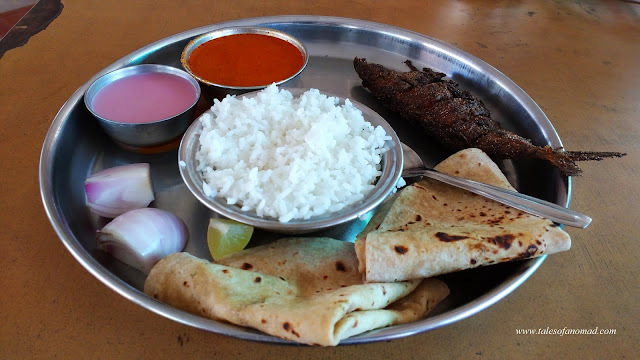 Ratnagiri and Ganapatipule has numerous restaurants that serve the local Konkani cuisine. 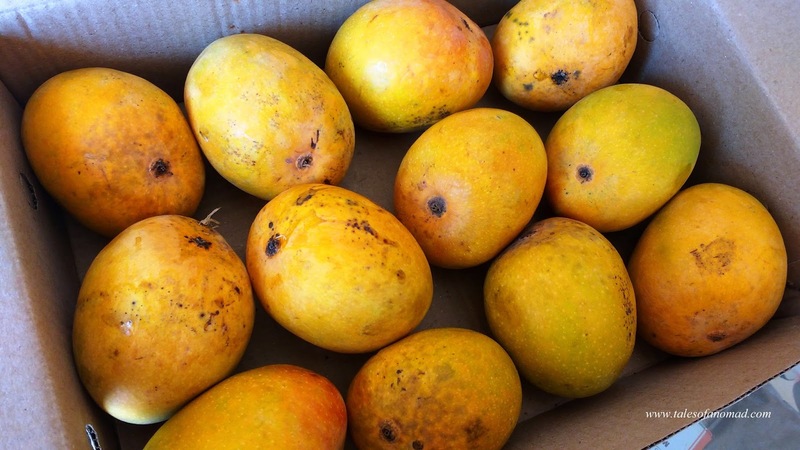 Alphonso mangoes are commonly available during the summer months of April and May. Ratnagiri is a fairly big city and it has a wide range of stay options from budget to luxury. I stayed at Bharve homestay, a few kilometers away from the town. Am sure you would love it. Head there soon. Very beautiful pics of beaches sunset mangoes forts & food ! Enjoyed this virtual tour of Ratnagiri through your lens ! ganpatipule beach is prisitne. Thibaw Palace is small but good. In spite of apparent aridity there's much beauty here. Lovely pictures. Interesting places to visit here, the fort resembles Bekal very much. Thank you. I think its fairly smaller than Bekal fort. Both the beaches and mangoes look tempting! Head out soon. Am sure you would love it. The soil is so RED, here. And the maanga and meen in the pics --look so YUM!! I miss the coastal cuisine. Absolutely delicious.